What a big weekend it was for us! We celebrated our Bigs’ 4th birthday. We had so much fun. 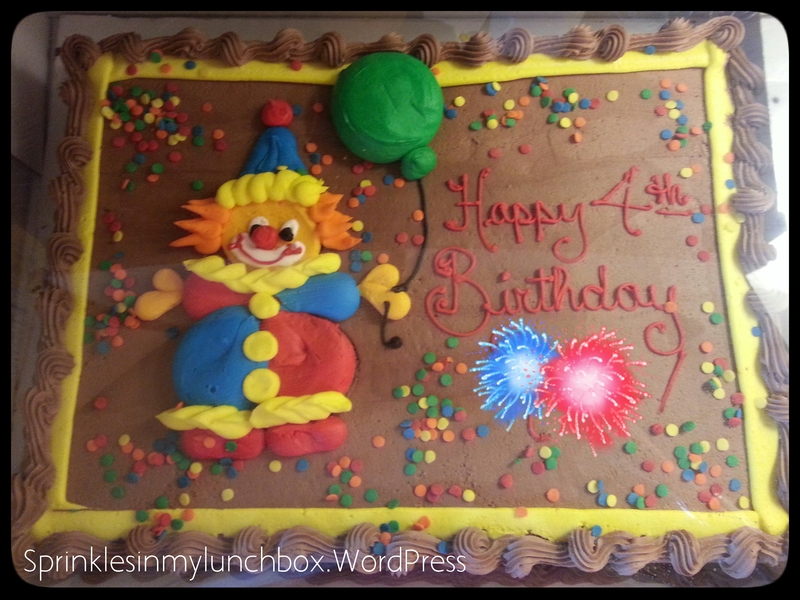 His birthday celebration started last Thursday, when I packed that fun birthday lunch for him for school. That night, we went out to get some of the food we’d need for his birthday party on Saturday. We found the corndogs at Target. While there, as per the usual, Bigs led us to the vacuum aisle. This kid loves vacuums. He always has. I am telling you, I’d not be surprised if he was the inventor of the next big, cool vacuum. 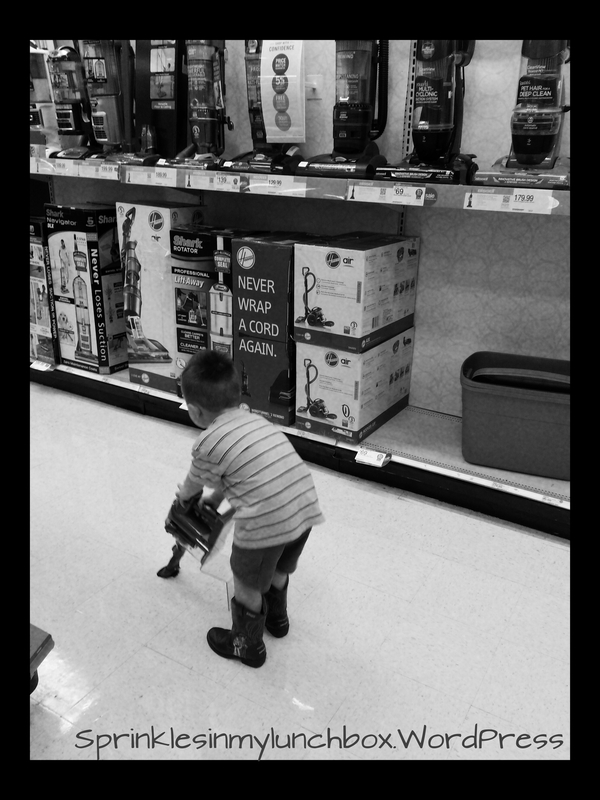 What a great way to spend your last night as a three year old – pretend vacuuming the Target aisles in your Woody & Buzz Lightyear boots. Friday was his actual birthday. Our original intent was to take him on the train after breakfast, but their schedules were not fitting in with our schedules and also it was RAINY. Like, a monsoon-rainy. So we decided to play his day by ear, realizing that our expectations of it might just be higher and more complicated that they needed to be…than Bigs’ expectations. So, we started the first day of his 4th year singing “Happy Birthday” to him and letting him open his present. We’d gotten him a whistle (yay for him, booo for us). That was all he’d asked for. All he wanted was that and to be able to eat a whole vitamin versus the half serving for children under 4. 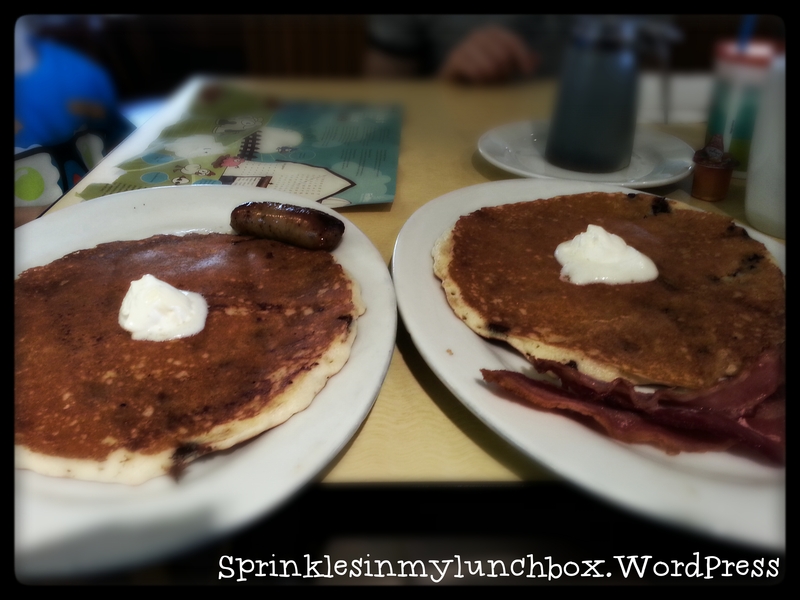 After those two exciting gifts, we went to have a wonderful breakfast. 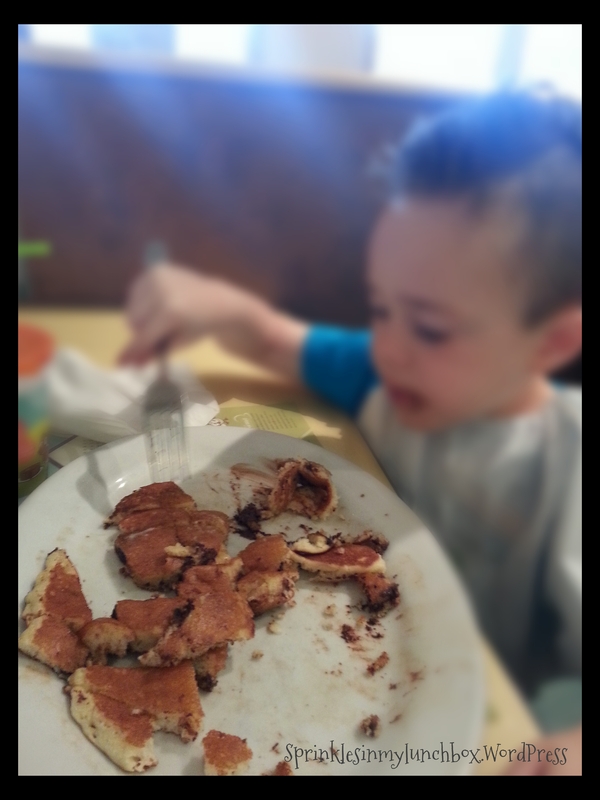 Bigs ordered chocolate chip pancakes (one huge one, in this restaurant). We got the same for Smalls. They were giant. Bigger than the boys’ heads. Just the way a birthday pancake should be. I’d say Bigs loved it. Those chocolate chips were smeared all over their sweet, little faces. 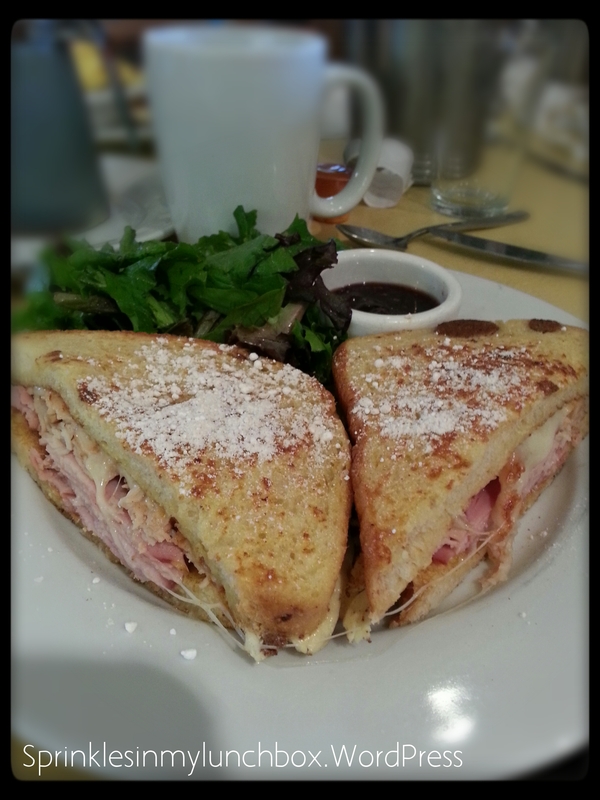 I ordered the French Toast Monte Cristo. It was really delicious. It came with some dressed greens. Husband got eggs over breakfast potatoes. With our bellies full, we went home for a little while to relax. Our neighbors came over to wish Bigs a Happy Birthday and we visited with them. That’s when the skies really opened up. When we were able to, we finally got back out into the storm to go to Toys-R-Us. Side note: that place, of all places, needs to put sanitizing wipes for their carts. Blech! 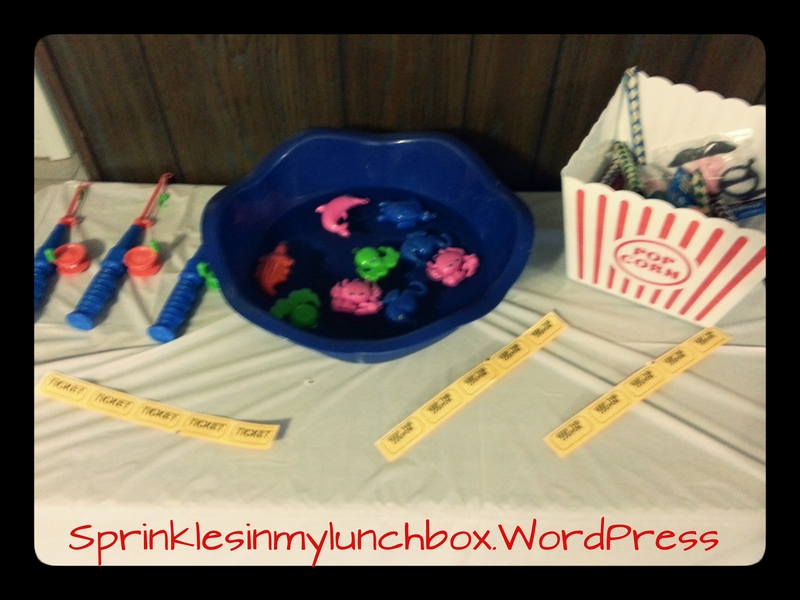 We surprised Bigs with a water table (yay gift cards!!). 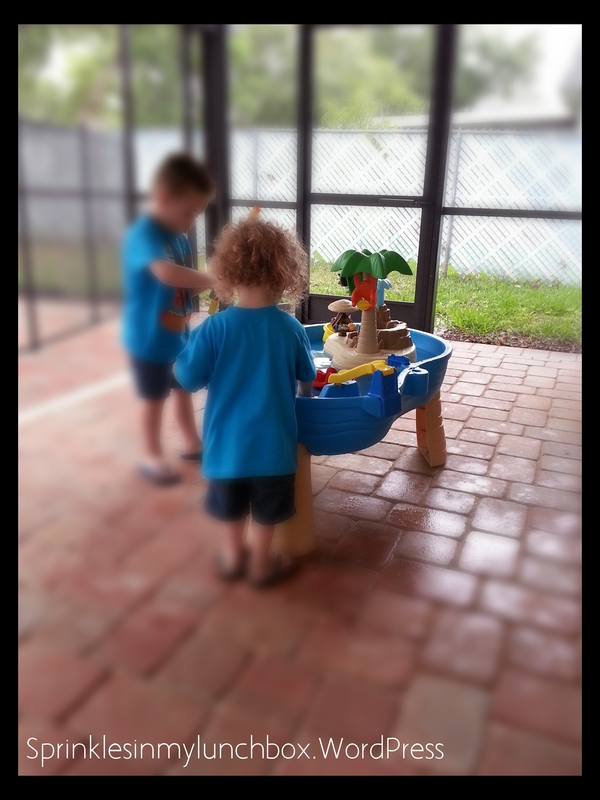 We went home and set it up and the boys had so much fun playing with it on the back porch. It was nice to be able to be doing something outdoors even though it was pouring outside. After naps, we went to Ale House, where they have both delicious food AND a gluten-free menu. 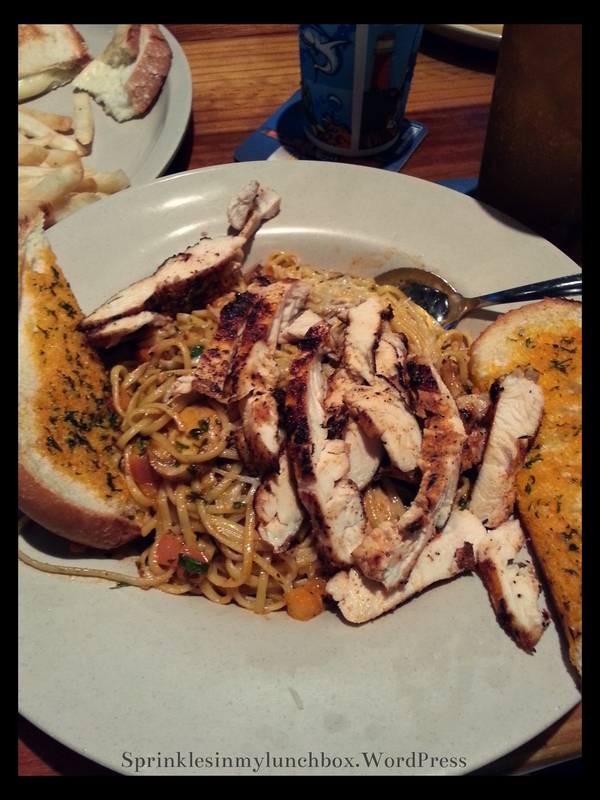 I ordered the Chicken Cajun Pasta. It was so good and there was so much of it, I got to eat it again at home! Husband ordered shrimp, Bigs ordered mini cheeseburgers and fries, and Smalls ate a grilled cheese and fries. We ordered a piece of chocolate cake to take home. It was also huge. We knew Bigs would love this as his birthday cake! 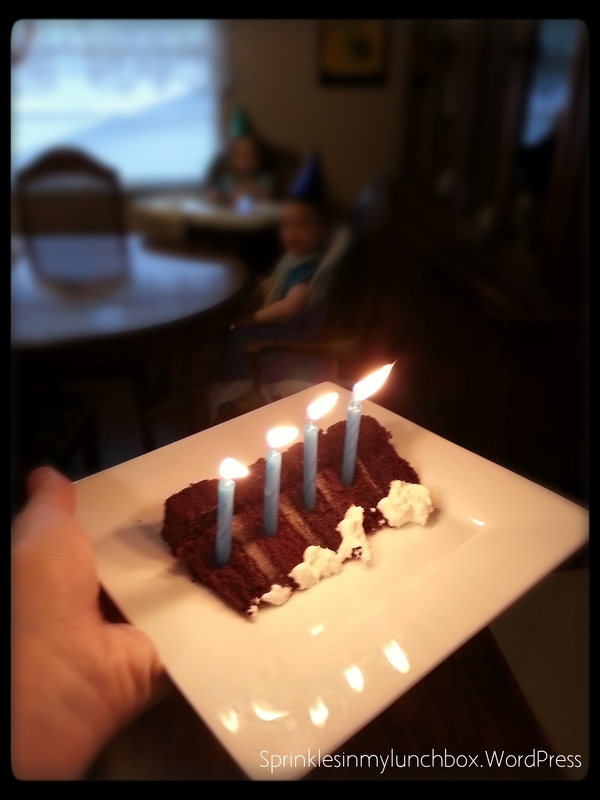 I stuck candles in a little slice for him and we sang! Even Smalls sang along, the best he could. I’ve been teaching him this song for weeks so that he could sing it to Bigs. The boys wore little birthday cone hats and enjoyed their cake. Saturday was party day! We’d rented a pavilion at our neighborhood park months ago, in preparation for this day. Quite sadly, the weather had gotten even worse than it was on Bigs’ birthday, the day before. All weather reports showed thunderstorms all day long. We didn’t have a back up plan, but we had to make one quickly. Before 7:00am rolled around, we decided to move the whole operation to our house. That would be the only way a birthday party would happen. Also sadly, my house was a pigsty. I’d neglected cleaning it, as I oft do, because I’d been so busy preparing for this outside birthday party. So we cleaned and cleaned and decorated and notified our guests about the change in plans. It was a frantic morning. And an extremely rainy one…we made the right decision. I found almost all my decorating supplies at the Dollar Store. 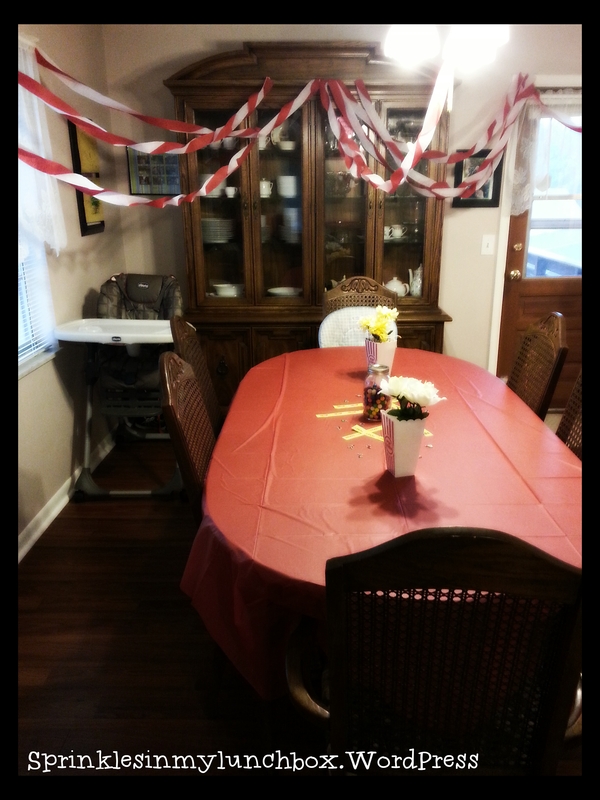 I put the centerpieces on top of red and white tablecloths. 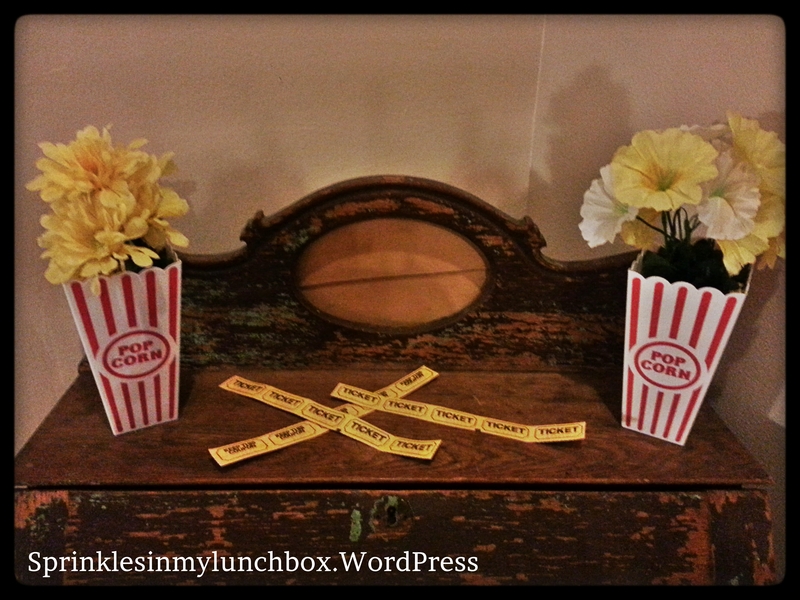 For the centerpieces, I put some yellow crinkle confetti in the bottom of a decorative plastic popcorn bucket and then some yellow and white flowers. Since these were supposed to grace eight picnic tables, and we were now partying inside, I put them all over the house. I actually love the way it came out. 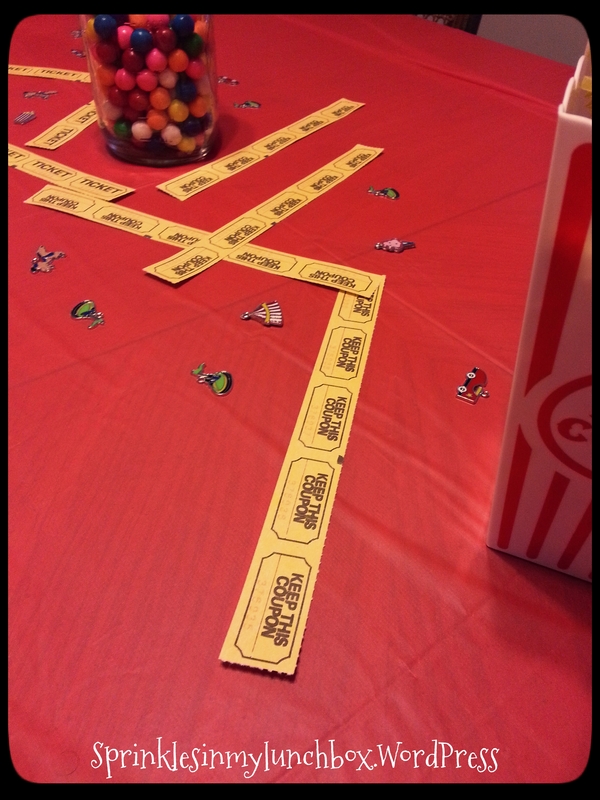 I also put some ticket stubs (also found at the Dollar Store) around, as a confetti. 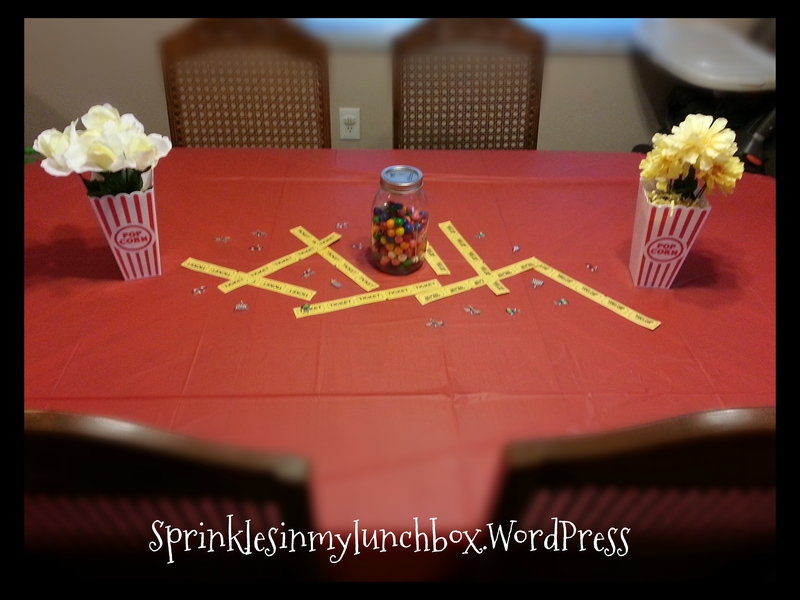 And for the dining room table only, I put some carnival charms, that I’d found online, and a mason jar filled with gum balls. 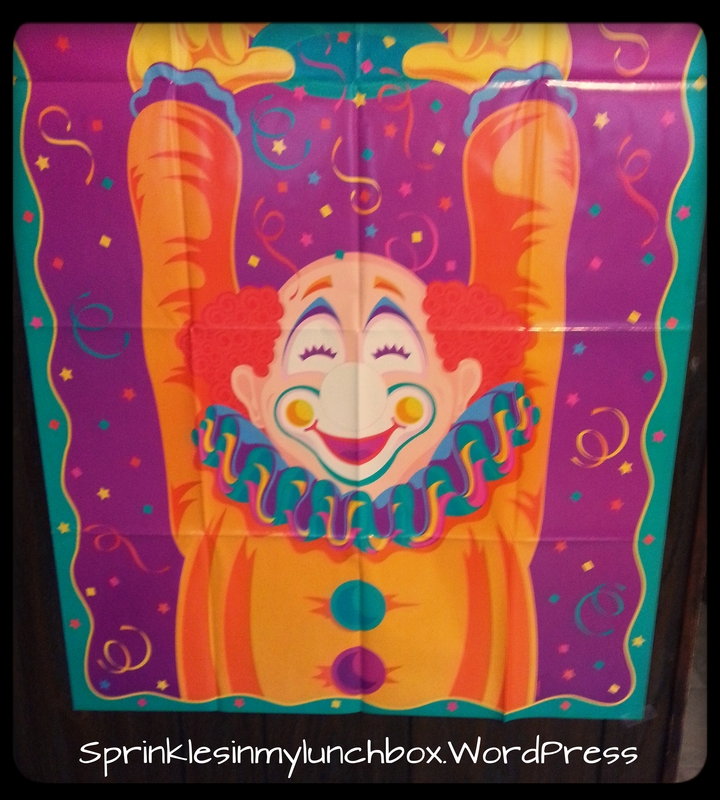 I twisted red and white crepe paper and hung it to look like a circus/carnival top, centering around Bigs’ chair at our dining room table. I did a similar thing on the antique desk that is in my foyer…. …and the same for the top of my TV in the living room. 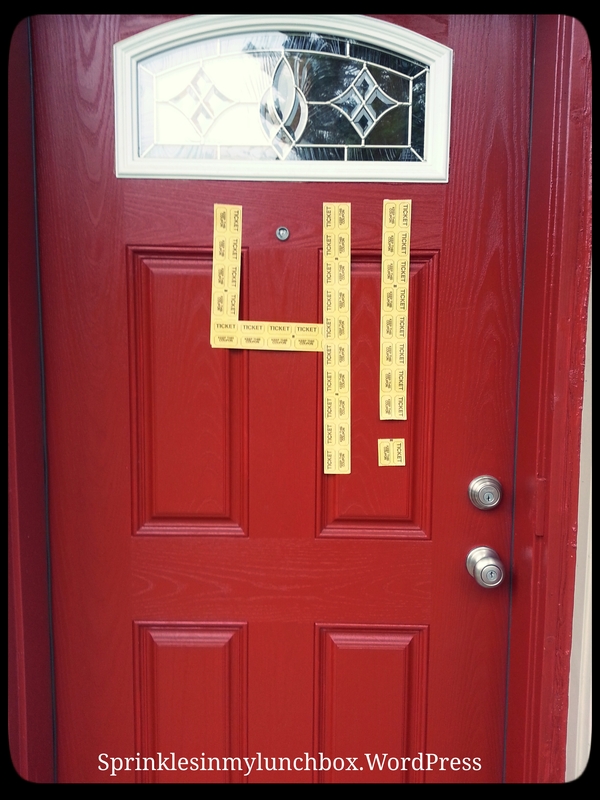 I made a “4!” out of tickets on the front door. And we also had hula hoops, and three little red baskets where the kids could throw three plastic baseballs. 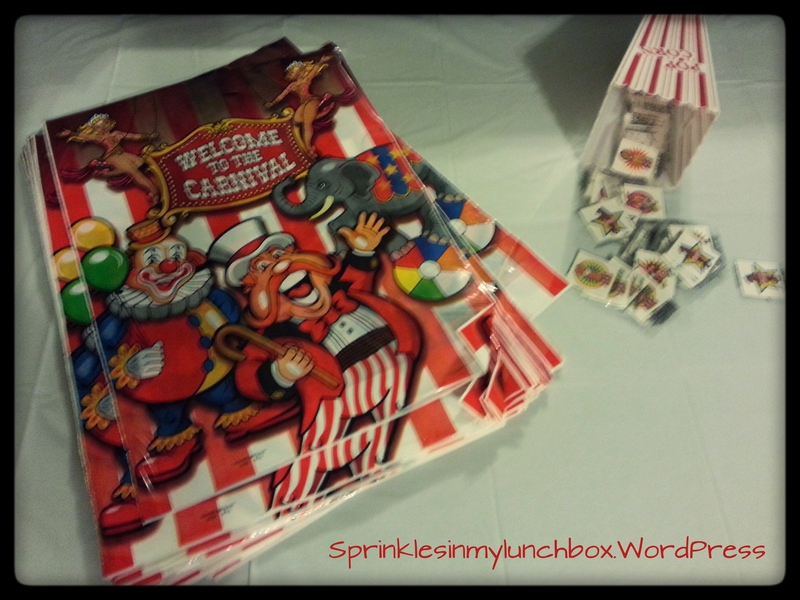 Here were some carnival bags for the kids to hold their loot in, as well as some carnival temporary tattoos. 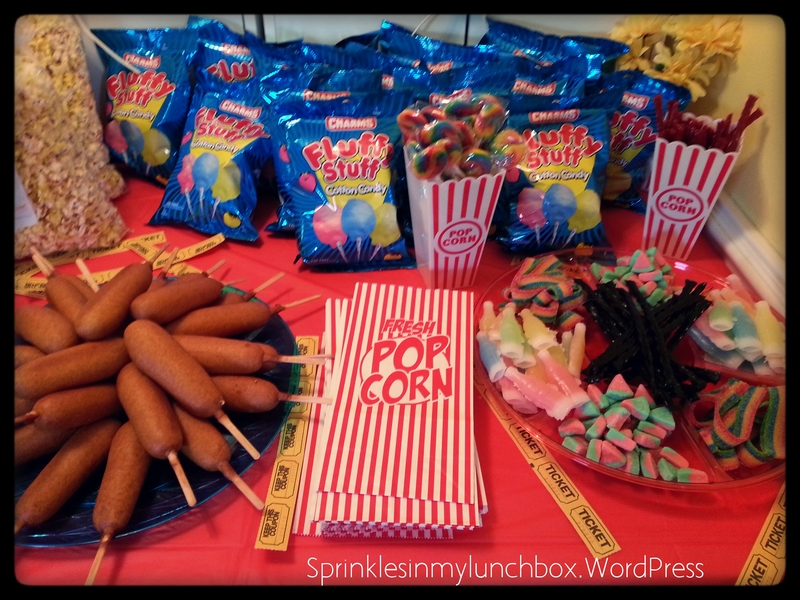 Then I set up the candy bar and food. 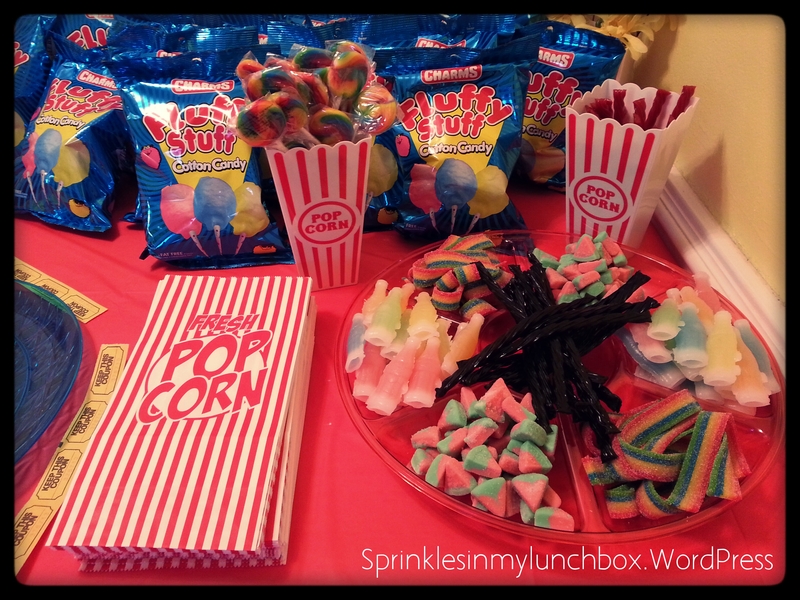 For the candy bar, I used bags of Charms Fluffy Stuff cotton candy (dollar store! ), licorice (red and black [I LOVE black licorice…I think my Dad and I are the only ones]), candy wax bottles, sugar-coated rainbow strings, watermelon gummies, and swirl lollipops. 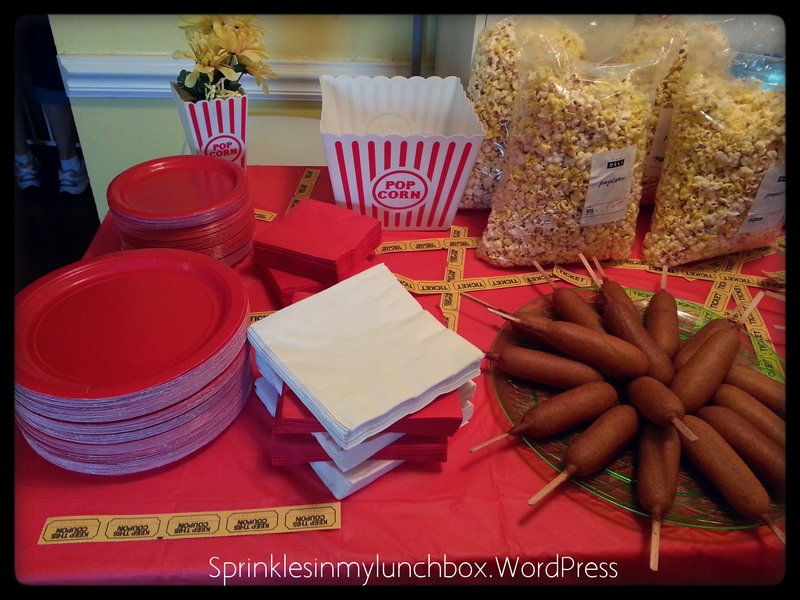 I placed popcorn bags next to the candy bar and popcorn so our guests could easily walk around with their treats. 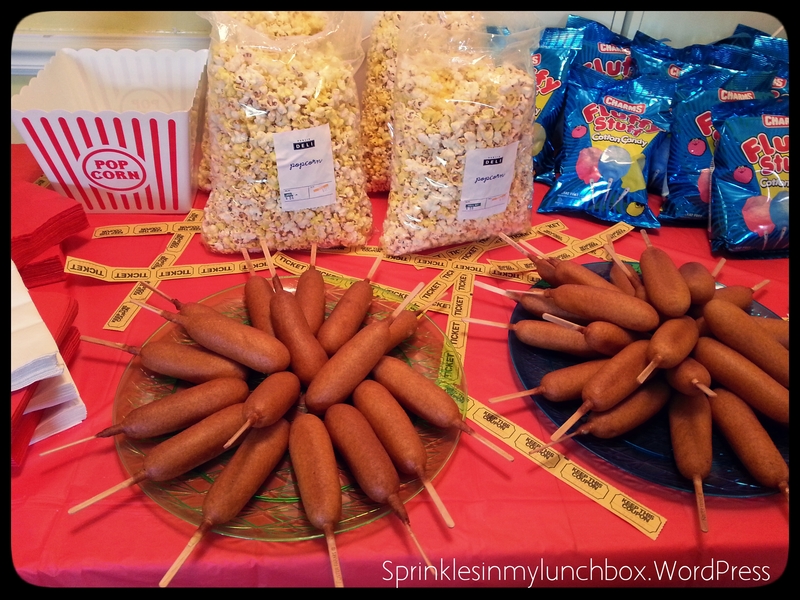 I bought bags of popcorn from the deli at Publix and made (my Mom was on duty) corndogs. 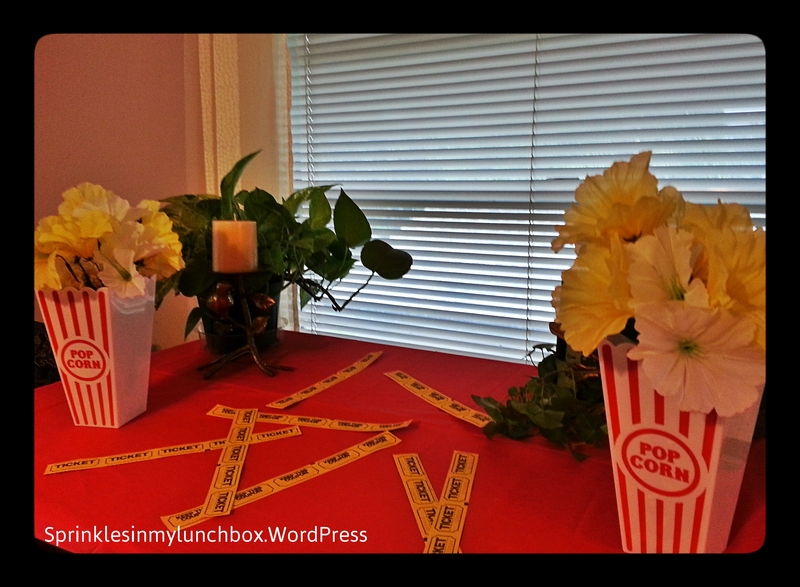 I used the same red and white theme with the popcorn buckets and flowers throughout. 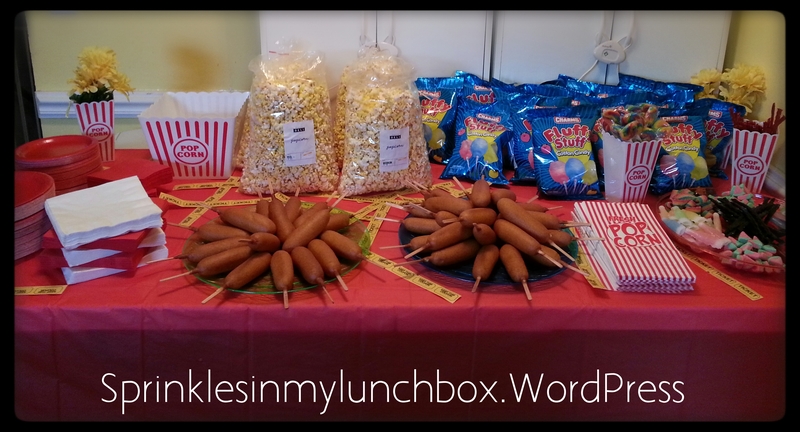 I love how the food table came out! The cake was DELICIOUS too. I didn’t make it this year, not for that amount of people. I got it at CostCo. Bigs requested chocolate, so chocolate is what he got! I asked for extra sprinkles because…that’s how we roll. It was really, really delicious. 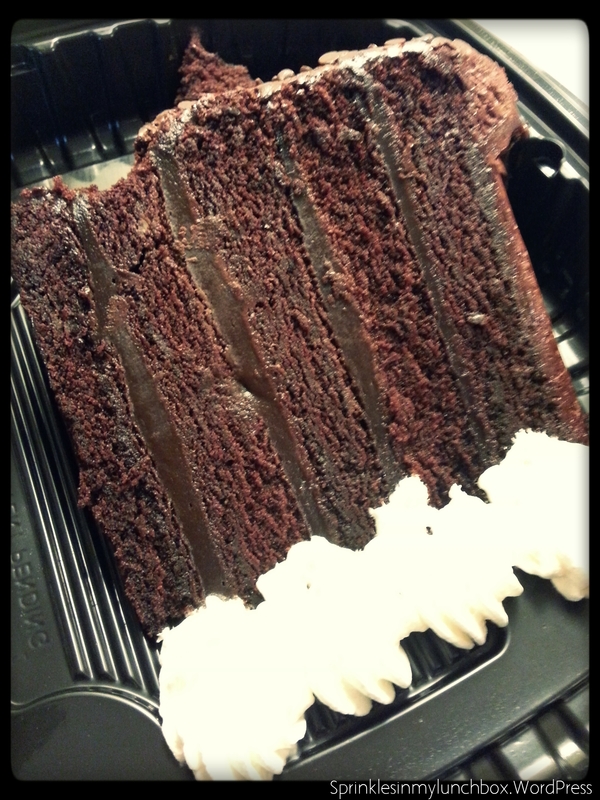 I LOVE Publix cake, but this was really tasty and a great deal! Bigs’ GF friend from school brought a GF cupcake for both herself AND for Husband. What great friends! And we served GF hot dogs and buns to them. Happy Birthday to you, Happy Birthday to youuuu, Happy Birthday dear Biiiigs, Happy Birthday to youuuu! It was great party! Thank you to all that helped and attended!